Easter, similar to other holidays, can be a stressful and difficult time for anyone. For some, it means a long weekend spent with families, having a get-together with food and chocolate. Unfortunately for others, it can be a deeply stressful occasion. Before Easter weekend approaches, take some time to stop and think about your needs. What is best for you? What will you enjoy? – How do you want to spend this break? Your needs are as important as those around you and they shouldn’t go unnoticed. If you are faced with anything difficult it’s okay to change your mind and say no. Perhaps if you wanted to, you could extend a hand to someone who may be spending Easter alone? A cup of tea can make such a difference. Our service will be closed on Good Friday (19/04/2019), Easter weekend and bank holiday Monday. We will re-open the following Tuesday (23/04/2019), thank you for your understanding. 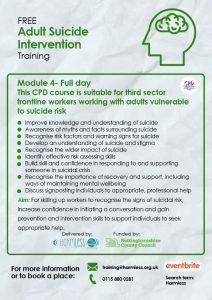 If you need immediate support please call Hope Line on 0800 068 41 41 or the Samaritans on 116 123. 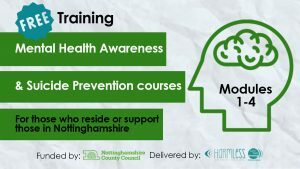 Let’s Talk Training are working with Nottinghamshire County Council to deliver FREE training to volunteers, those involved in mental health community schemes and third sector frontline staff working or living in Nottinghamshire. 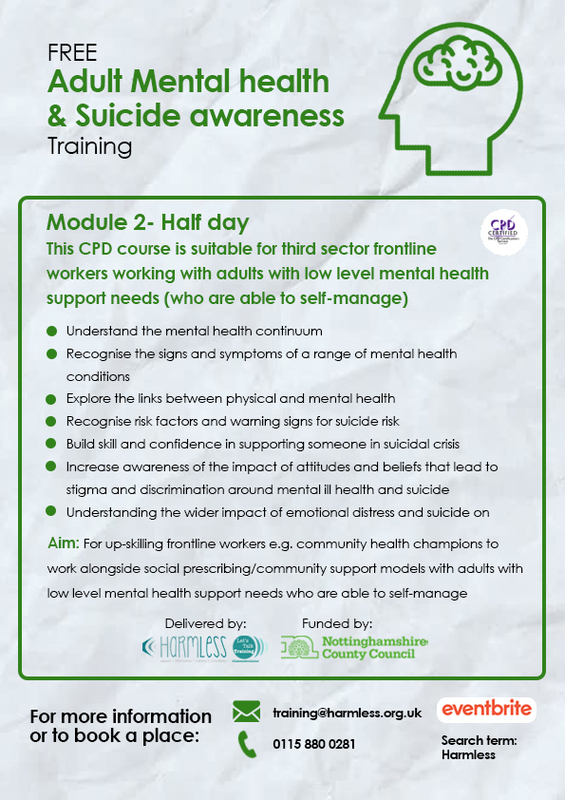 Module 2: This course is for third sector frontline staff who work with adults (18+) with low level mental health support needs i.e. 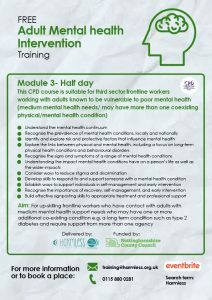 Those with undiagnosed mental health conditions or those with low mood or worry. 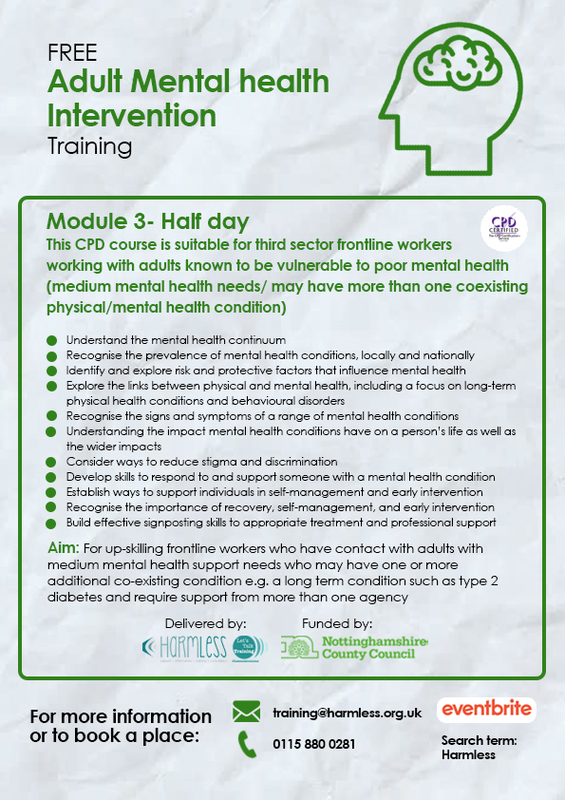 Module 3: This course is for third sector frontline staff who work with adults (18+) with medium level mental health support needs who may have one or more coexisting conditions. 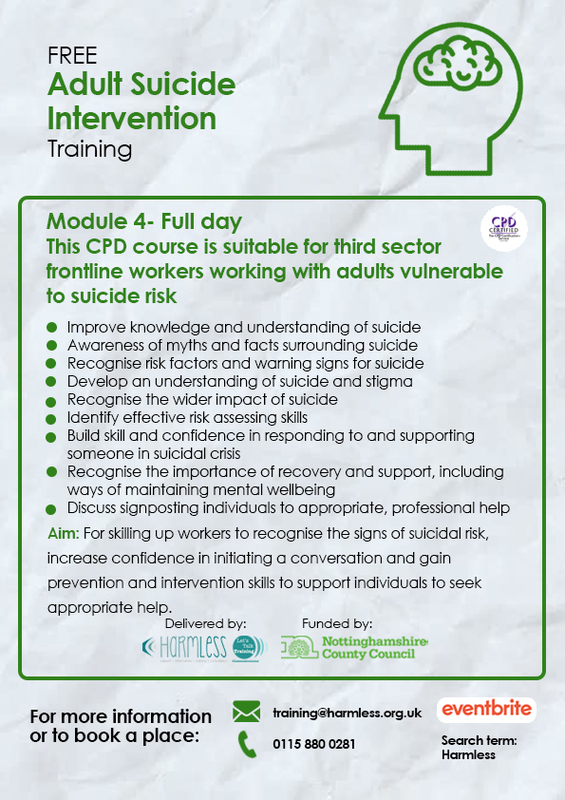 Module 4: This course is for third sector frontline staff who work with adults (18+) who are vulnerable to suicide risk. Sesame Street is expanding the storyline of resident muppet Julia, who is on the autism spectrum, as part of Autism Acceptance Month this April. As part of the initiative, viewers will get to meet her family — including her parents, big brother and dog — for the first time. In 2015, Sesame Workshop launched “Sesame Street and Autism: See Amazing in All Children,” an online initiative introducing Julia as a digital character in a storybook called “We’re Amazing, 1,2,3.” Sesame Workshop spent five years on the initiative, consulting with 250 organizations and experts within the autism community. Julia made her on-air debut in April 2017 and has since been a regular character on the show. Through Julia, kids learn that while some kids with autism may be able to speak, verbal communication can be challenging, resulting in single words and sometimes, when overwhelmed, the use of a communication board. The show has highlighted other characteristics of autism, such as stimming, and how to respect the boundaries of someone who prefers minimal physical touch. The new videos and materials are available in English and Spanish. On April 8, HBO and PBS KIDS will premiere a Julia-focused Sesame Street episode. Julia’s friends, Elmo, Abby Cadabby and Alan play “hair salon” with Julia to help her better cope with an upcoming haircut. According to Sesame Street, this segment was created as a response to families who asked for resources addressing common challenges for children on the autism spectrum. In addition to introducing new resources and characters to further develop narratives surrounding autism, Sesame Workshop is expanding its autism initiative by partnering with Barnes & Noble. On April 6, the bookstore chain will hold a sensory-friendly reading of the “Family Forever” storybook and accompanying activities in over 600 locations. The 2018 digital storybook will be released as a hardcover edition by Random House. Sesame Workshop will also participate in the World Autism Awareness Day Symposium in Japan by joining the Tokyo Tower lighting ceremony. Every child, adolescent or adult who enters is a friend to someone, loved by someone, a family member, a teacher, a pupil, a colleague. Every person has a network of people around them that they are important to. Every person who enters our service has their own unique needs, and our wonderful team work in many creative ways to support those needs to aid recovery. Many of our wonderful people who support like prefer to donate an item that will really make a difference. It could be an item that will support a family going through a difficult time, or an item that will support the people who sit in the waiting room whilst their loved ones access treatment. 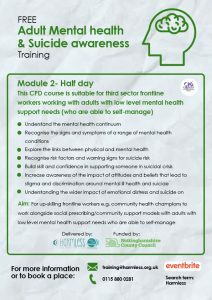 We also need items to help our therapists and support officers to do the best job they can possibly do. If you would like to support our service please take a look at our Amazon Wish List and see what we’re currently in need of. If you would like to support us by buying something we need we have an amazon wish list set up. 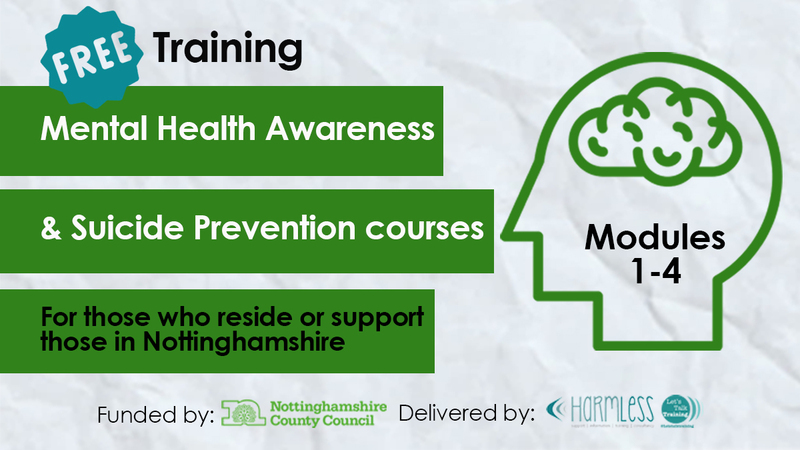 We regularly review and update this list based on what the team and service users need. By buying something off this list you can be sure you are providing something that will really make a difference. On behalf of our team: thankyou! Your support is truly appreciated. If you buy something off this list please send us an email to info@harmless.org.uk so we can personally thank you. I recently became involved with the Joseph Maley Foundation, an organization that was founded in 2008 by the parents and siblings of Joseph Maley. Joseph was born with physical and cognitive disabilities and was nonverbal. He touched the lives of many in his 18 years of life, and the foundation’s goal is to carry on his legacy by serving children of all abilities. They provide sports programs for children with and without disabilities to learn to adapt and play together. They provide education to school-aged children about what it’s like to live with a disability through their “disABILITY Awareness Weeks” at multiple schools in the Indianapolis and surrounding areas. Their mission is to educate children about disabilities, and to hopefully make it easier for able-bodied children to understand and accept others living with disabilities. I have become a regular speaker at many of the “disABILITY Awareness Week” programs. I speak to elementary school children about my disability, how it affects me, and more importantly, how to see the person behind the disability. I feel it is important to educate children about disabilities. Children are inquisitive. So many times I hear parents shush their children when they ask about someone’s disability in public. It’s not wrong to ask. If they never ask questions and are never educated about disabilities, they will be less likely to try to befriend a peer with a disability. Humans are conditioned to notice differences. When we see someone using a wheelchair or other assistive device, we notice it. That’s not wrong, it is human nature. Our mission is to educate others, and allow them to be inquisitive. Asking questions opens up a dialog that can help you understand that person on a deeper level. Once we understand our differences, they become less scary. Opening this type of dialog takes you one step closer to understanding and acceptance. If we can have open discussions with children about disabilities, this helps eliminate the fear of approaching someone with a disability and facilitates a safe place for them to get their questions answered. More importantly, it shows them that people with disabilities are not much different than themselves. We all have weaknesses, barriers and things we are self-conscious about. When we look past our differences, we find more similarities than we realize at first sight. When I speak to children about my experiences as a person with a disability, I try to focus on the fact that while we may do things a little differently, we also have many similarities. I encourage them to ask about disabilities because that is the only way they will learn. Education is a powerful tool to combat bullying. When we know more about a person, when we can see them as human beings with feelings, we are less likely to judge them unfairly. Dogs in the classroom — coming to a school near you soon? When you think about your own school days, you might have had a furry friend to keep you company in the classroom — maybe a school hamster, rabbit or guinea pig. But what about a school dog? That’s what’s being suggested by the vice chancellor of the University of Buckingham, Sir Anthony Seldon, who made a speech at the university’s ‘Ultimate Wellbeing” conference promoting school dogs as ‘a powerfully cost-effective way … to improve mental health in our schools’. Also in attendance at the conference was Damian Hinds, UK education secretary, who spoke in support of bringing dogs into schools to enhance well-being and claimed every school should adopt one. It might sound barking mad, but a school dog could be one way to help make schools a homelier environment as an antidote to the competitive and performance driven places they have become. It could also be a low-cost way of introducing a ‘therapeutic effect’ which Aubrey Fine, a well respected expert in animal-assisted therapy, describes as the well-being benefits that arise simply from the presence of an animal. Getting dogs into schools, however, isn’t as simple as it sounds. The idea that ‘every school needs a dog’ is problematic. But an aversion to animals in schools distances children from unique, developmentally rich and life enhancing experiences. It is entirely possible for a dog to thrive in a school if the animal is not seen as a commodity but a community member — as advocated by the Dogs for Good charity. Boris Levinson, a professor of psychology, suggested back in 1972 in his book Pets and Human Development that animals can help address ‘complex stresses created in a technological society whose values and institutions are in many ways dehumanising’. Levinson introduced the idea that the presence of an animal can be a ‘force’ for enhancing children’s social and emotional skills and their capacity to relate to others on an emotional level. Various education pioneers, including Rudolph Steiner, Maria Montessori and Susan Isaacs, have also described how animals bring children back to the rhythms and realities of the natural world. That said, not everyone will be thrilled by the idea. There are those who are allergic, not a fan of animals or are even scared of dogs after a bad experience. There are also welfare concerns — specifically the potential for harm to animals, children and other people — and damage to property in the school is possible. Animal welfare organisations like the Dogs Trust say that dogs should not be used in schools to mitigate the potential for harm and to protect the animals. Alongside this, there are often (but not always) restrictive health and safety policies in a school preventing dogs on the premises. But none of these factors should overshadow the asset that a dog could be in school life. A good starting point for any school leader interested in introducing a dog, who wants to understand the theory and recommendations, would be the new Code of Practice, which has been developed by a leading UK human-animal interaction organisation — The Society for Companion Animal Studies. The person in charge of the dog should also have an appreciation of anthrozoological theory . This is the study of interactions between humans and other animals. They also should have undertaken appropriate training. The animal would need to be temperament checked by a professional animal behaviourist and will need training and ongoing support to be comfortable in the school environment — schools can be noisy places and children can be unpredictable. Children and other adults in the school would also need to be briefed on acceptable interaction with the dog — with rules of engagement — certainly no pulling on its tail or chasing it around the playground. Ultimately, though, a well selected and happy furry friend in school can help children in many ways — not just with well-being. It can help children be more motivated in their learning — specifically with reading. It also makes them less likely to develop allergies. And for most children having a dog around is fun and enjoyable — it is something they can seek comfort from, learn about, a community talking point. A school dog also can be a fun teaching assistant to make the day more enjoyable — bringing a whole new meaning to the idea of a teacher’s pet. Dutch book lovers got free rail travel across their country’s entire network this weekend as part of the Netherlands’ annual book week celebrations. Every year since 1932 the Netherlands has encouraged reading with Boekenweek – a celebration of literature marked with literary festivals and book signings across the country. Traditionally, a well-known Dutch author writes a special novel – the “book week gift” or Boekenweekgeschenk – which is given out for free to people who buy books during the festivities or sign up to a library. But the special book – this year the novel Jas Van Belofte by celebrated author Jan Siebelink, can also be presented instead of a rail ticket on every train in the country on the Sunday of book week. Nederlandse Spoorwegen (NS), the Dutch state railway company, has long been a sponsor of the annual festivities – and even organises book readings signings by top authors on its trains. “It is good to see all those happily surprised faces of travellers,” author Jan Siebelink said after boarding a train for the city of Utrecht to meet passengers and read his book. This year the book week gift was given out by bookshops to anyone who spent €12.50 on Dutch-language books. “That is why we have been the main sponsor of a number of reading campaigns for years, including Book Week. NS is not the only railway company to accept physical objects in lieu of payment. This time last week for a week UK rail company Virgin Trains offered a 1/3 discount to passengers aged 18-30 who presented an avocado to ticket inspectors, as a dry joke about the delayed Millennial Railcard. A teacher in the San Francisco Bay Area has gone viral after she shared an ingenious idea on how to help students with their mental health. After having several students struggling in the past five years, English special education teacher Erin Castillo decided it was time to do something – and so, introduced the mental health check in board in her classroom. Students can pick up a post-it, write their name on the back and place it wherever they like on the sheet with six categories from ‘great’ to ‘in a really dark place’. They can also specify that they ‘wouldn’t mind a check in’ if they need it, without having to utter the words, but simply placing their post-it on that part of the sheet. After seeing how well it worked with her own students, Erin decided to share the concept with the wider teacher community and uploaded a free digital copy on a platform known as Teachers Pay Teachers. The check in sheet quickly went viral after that with one teacher, Jessie Cayton, sharing it on her Instagram page after she created one for her own class. Teaching children about wellbeing is as important as road safety, best-selling author Matt Haig has said as he calls for mental health to be added to the school curriculum. However, Haig, who is known for his children’s books which unpick mental health issues for young readers, warned against so-called ‘helicopter parents’ “editing” their sons and daughters’ lives. Speaking to The Sunday Telegraph, the 43-year-old who has written about his own severe depression, warned parents and schools they must “get ahead of the game”. “It’s just as important as road safety,” he told The Telegraph, “I think we need to get ahead of the game on this, it’s evolving so fast and it feels like everyone’s so behind in terms of technology and health. His call comes after this newspaper revealed a potential shake up of Ofsted’s school inspections to include an assessment on mental health and wellbeing. An NHS report last week found that more than one in ten boys at primary school are being labelled as suffering from a mental disorder. Researchers found that boys aged between five and ten were twice as likely as girls the same age to suffer such problems. The study also suggested that children from middle income families have twice as many mental disorders as those from poorer backgrounds, something that Haig links to an overload of technology devices, parental pressure and increased emotional awareness. In his book, Notes of a Nervous Planet, Haig gives tips on coping with the “switched on” aspect of the modern world. He said: “Kids now have got more in their lives, they never have to be bored in this world of constant distraction. No adult would let their kids smoke 60 cigarettes on an evening but because that’s physical health it’s so clear cut, with mental health it’s still a bit abstract for some people. “Boys are also dealing with the pressures that were traditionally the girls’ pressures. They’ve got the looks pressure, there’s apps out there now aimed at men and boys aimed at giving your photos a six pack. Haig, who lives in Brighton, started writing children’s books aimed at unpicking mental health following the success of his memoir, Reasons to Stay Alive which reflects on his severe depression between the ages of 24 and 32. In it, he links the malaise of modern society to the prevalence of mental illness, something he explored more deeply in Notes on a Nervous Planet, which gives tips on coping with the “switched on” aspect of the modern world, and has recently come out in paperback. Haig decided to home-school his children, Lucas, 11 and Pearl, nine, when they didn’t seem happy going into class everyday. But his latest children’s book, out in August, follows the adventures of his well-known character, the Truth Pixie, as she embarks on the opposite – her life at school, where it is “hard to be true”. It follows the success of The Truth Pixie, a bestseller that has sold 65,000 copies since its 2017 release. Haig has been nominated three times for the Carnegie Medal. “We’re in this age now where we are expected to be these magazine versions of ourselves and present an image to the world, and kids feel that even more than we do. Haig, who has always been open about his mental illness with his two children and regularly brings them to his talks, still worries about getting their education right. “They’ve seen all kinds of stuff, and often young people will be drawn to the more sensationalist stuff as well – there’s an infinite amount of anything out there,” he added. But he does not think parents should monitor everything their children do. Haig said he believes children need to learn to ‘“clear up” their own messes. When you’re with your kids all the time and editing everything they do and making decisions for them all the time, that’s not healthy either,” he added. Matt Haig’s ‘Notes on a Nervous Planet’ is out now in paperback.